On the 11th of April, the School of Pre-University Studies of KDU University College recently held its annual Math & Science quiz. Approximately 870 participants from 29 schools participated in the quiz, fighting for the title of Champion, with my school being one of them. It all started during our Chemistry class, when Datin Tan Kok Suan, our beloved Chemistry teacher, asked my class, 5 Orkid, to participate in the quiz. We readily agreed, and pretty soon, we found ourselves on the morning of the quiz, all primed up and ready to go. After a short trip, we reached the Damansara Jaya campus, where we were ushered into the hall. All the schools arrived at the same place at the same time, hence the scene somewhat resembled a human traffic jam. Hopefuls flood the air with nerves and scientific notions alike, making everything pretty much charged up. Anyways, we then returned to our places for the briefing. After long pauses to ensure that everyone received their answer scripts and question papers, we then started. Chemistry, biology, and physics litter the question paper alongside mathematics; but little did we expect being asked general knowledge questions, especially Obama’s home state! Nevertheless, the 40 minutes allotted for the quiz simply whooshed by, and before we knew it, it was time to hand in that paper. As the papers were whisked away to be marked, our ushers took us on a tour of the campus (which we already ventured around). The computer labs, resource centre, science labs: these were where we stopped by as we braved the sea of students touring the campus with us. After that, we went for lunch. Entering the hall, we sat down as Dr Todd Nelson started his speech with the little Malay he knows, considering he has been in Malaysia for 4 years! Congratulating us for actually participating in the quiz, he went on to give out certificates of participations to our accompanying teachers. Then, enter the nerves. Emotions ran high, and cheers resonated through the hall as the results were read out. The champion, Leong Chee Yean from SMK Bandar Utama Damansara (4), walked home with a 100% tuition fee waiver in any KDU Pre-Unuversity programme. Runner-up was Grace Ng from Catholic High School and in third place Goon Zhu Wei from SMK SS17. 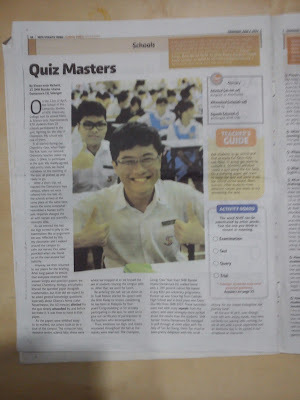 These successes were met with crazy squeals from the ushers, who were strangely more excited about the results than the students.SMK Bandar Utama Damansara (3) managed to pull through at ninth place with the help of Tan Jia Cheng. Datin Tan must’ve been pretty delighted with this small victory, for she smiled throughout our journey back!